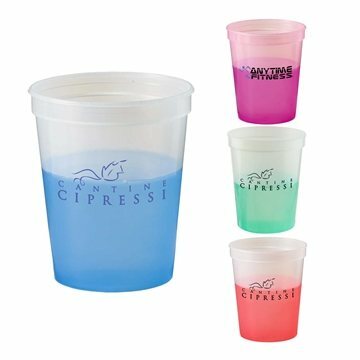 Thermo sensitive color changing Mood Stadium Cups are reusable & recyclable. Cups change color at 58˚F. they were great everybody seems to like them. Write well and appear excellent. We will be giving them to our customers for presents during the holiday season. Printing is excellent. the people at AnyPromo were very easy to work with when it came to working on our name and logo.